"ASEAN Earth Resources And Geoscientist Role in AEC Era"
Welcome to the GeoSEA XIV and 45th IAGI Annual Convention 2016, or “GIC 2016” where the Regional Congress on Geology, Mineral Resources and Energy in SE Asia collaborates with the annual scientific meeting of the Indonesian Association of Geologists (IAGI – Ikatan Ahli Geologi Indonesia). This convention aims to bring an excellent opportunity to exchange scientific, technical information and to advance geoscience in multidisciplinary fields including oil, gas, mining industries as well as other related fields. 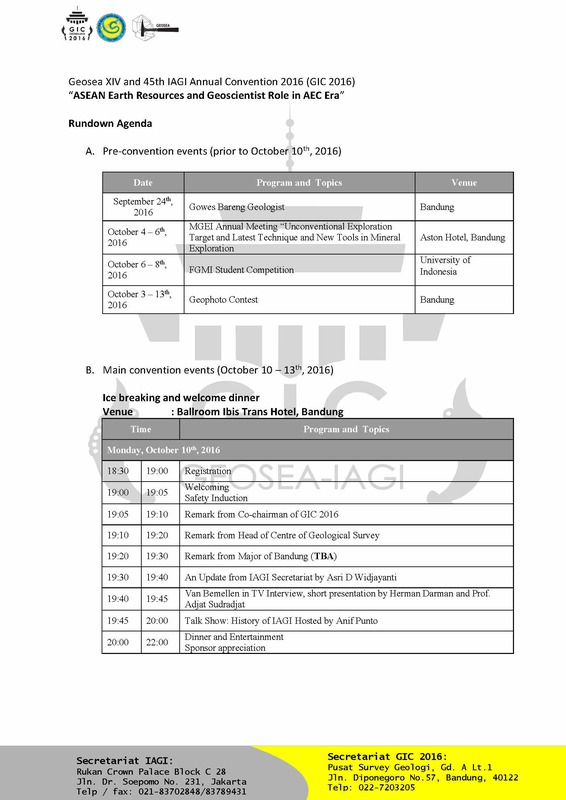 Ikatan Ahli Geologi Indonesia (IAGI – Indonesian Association of Geologist) is organizing the gEOSEA XIV Congress and will be collaborated with the 45th IAGI Annual Convention 2016 or ‘GIC 2016’. This parallel convention will offer an excellent opportunity to exchange scientific, technical information and to advance geoscience in multidisciplinary fields including oil, gas, mining industries as well as other related fields. The main convention of GIC 2016 will be held in Bandung, 10 – 13 October 2016 and consists of opening remark, panel discussion, GEOSEA Board Meeting, technical presentation, invited presentation as well as exhibition. To complement the main convention, an exciting range off pre and post convention is planned on various events including social program, geophoto, student competition, fun bike, running 5K and field trips. We look forward to welcoming you to the GIC 2016 in Bandung. "Unconventional Exploration Target and Latest Technique and New Tools in Mineral and Coal Exploration"
Basement & Paleogene Sediments of SW Java : Subduction Trench, Deep Water, Shelf, to Delta Environments | Carbonate Sedimentologi & Sequence Stratigraphy of Rajamandala Formation | Exploring The Megalithic Site of Gunung Padang : "Geological Phenomenon or Manmade Building"